Boone County Commissioners accepted a gift to the county during their regular meeting Monday, Dec. 13. Mel Andrews brought an unusual antique vase, which had been donated to the Boone County Courthouse this week by George L. Patrick of Grand Island. 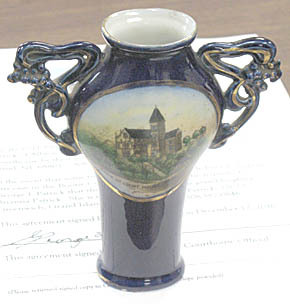 The dark blue vase features a full color painting of the original Boone County Courthouse (1896 to 1976). The vase is not dated, but was owned for many years by George L.’s parents, George and Mary Patrick, who were former Albion residents. 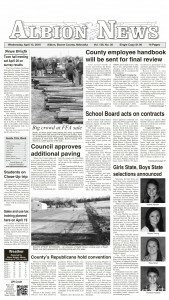 Commissioners said they will have a special case made for the vase, and it will be displayed in the courthouse lobby.